Yesterday night I was scrolling through my personal Facebook newsfeed when I stumbled across a sight that I couldn’t believe. Before my eyes was a photo of my younger sister hanging out in Hongdae(a dynamic, youthful entertainment/arts area in Seoul) with her friends, wearing my Yale University hoodie. I couldn’t believe she had the cheek to go through my closet and take my clothes without asking my permission first. Doesn’t she know how much I adore my clothes, especially that hoodie? And most importantly, post a photo of herself wearing it on Facebook, where she knows I’ll inevitably see it?? Those of you that are females with female siblings probably know what I’m sayin’ here. (I feel you.) On the other hand, the other 70% of you out there are reading this thinking ‘sensitive much?’. This post is dedicated to the other 70%. Plus anyone else who is wondering why women overreact over clothes. FYI, the image above is a real-life situation that occurred at an Alexander Wang event a few months ago. The designer let some fans take away free clothing at the special event in NYC. Fashionistas were going crazy and barbaric to get clothes. To check out the video, click here. I’ll keep this very straightforward and crystal-clear. 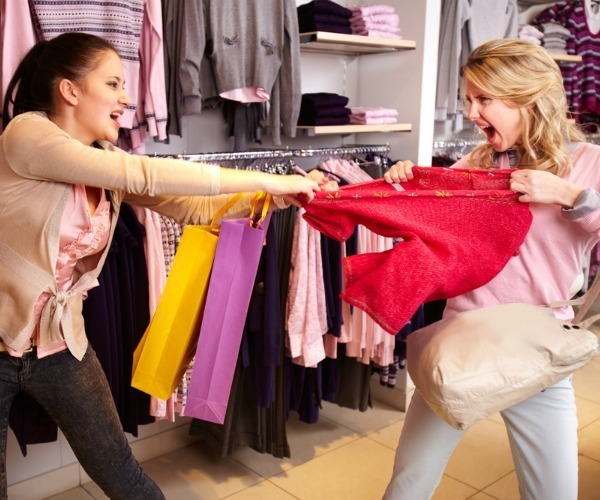 There are several reasons why we fight over clothes(not only based on clothing-buying situations but in various possible situations). #1. Because we give it sentimental value. We associate it with a certain memory in the past. This applies to my Yale hoodie example above. I got the hoodie on my first trip to the US about a year ago. That week in the US -exploring Times Square with my closest friends, learning debate in Yale University, sharing secrets in the hotel room… It was the best time of my entire life so far. And the hoodie, being a part of it, means a lot to me. I don’t even wear it out often in case I might ruin it(which I often do do to my other clothes). #2. Because clothes identify us. Imagine what would happen if Jack Sparrow never found his triangular-shaped hat. 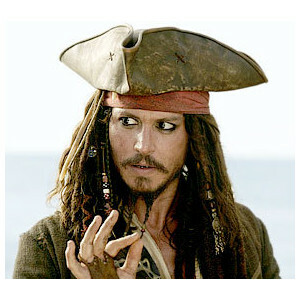 The hat appears in every movie, in almost every single scene with Jack Sparrow in it, because it defines his character. Imagine what would happen on the day that Lady Gaga starts dressing in plain, grey, formal business attire with glasses, no makeup, and her hair pulled back into a ponytail (I wonder if I’ll ever live to see that day). Likewise, us non-pirates and non-celebrities also try or don’t try to express our inner selves through our clothing(if you don’t, that’s also a way of making a statement that you don’t care). And if you take or destroy our clothing, you’re indirectly damaging a part of our self-identity. That’s why I get mad at you for taking my clothes, sis. #3. Because clothes are worth a lot in the current era of humanity. The fashion industry is seeping into social media, magazines, books, education, art, and so much more. As more and more people accentuate fashion and clothes, and as society increasingly appreciates clothes as pieces of art and culture, clothes are worth so much more than before, both money/economy-wise and social-perception-wise. It’s only natural for us to accept this and shout bad words at you when you accidentally rip that new Hermes dress that I just spent $3,000 on. I want the pirate hat.. haha : D I got your email! I’ll send you the answers later today. Hahaha, this is the plain ol’ truth! Yup! : ) Thanks for visiting my blog!